As early as 1847, Holland’s Dutch settlers wanted the government to clear the silt and sandbars that blocked access from Lake Michigan to Black Lake (which was eventually renamed Lake Macatawa). Residents knew a harbor was essential to build business and increase the area’s population. But despite their numerous requests, the government failed to act. Taking matters into their own hands, settlers dredged using hand and machine tools and then built a pier to form a harbor. By 1860, they had cut a channel between the two lakes that could float barges. It took seven more years for the federal money to begin harbor improvements, however. From 1867 until the turn of the century, after fits and starts, the government finally finished the project. By that time, though, other harbors on the west coast of Michigan had been established for commercial business. Instead Holland took advantage of the growing summer resort business. Two daily trips via the Graham & Morton steamship line brought families from Chicago and Milwaukee to visit the area. A lighthouse proved necessary. In 1872, the government spent $4,000 to build a small wooden lighthouse on an open platform above the pier deck. The lantern room had ten windows and a small enclosed space for the keeper to tend the fifth order Fresnel lens during rough weather. The first lighthouse keeper, Holland resident Melgert van Regenmorter, had to walk along a catwalk built above the crashing waves over the pier from his shore side house, carrying his oil lamp all the way. By 1880, a new light was housed atop a metal pole in a protective cage and lowered by pulleys for the keeper to service. He blew on a fish horn, a flat curved instrument with carved scales, to signal any vessels during thick fog. Such a relentless task often took many hours or all night. Keeper van Regenmorter earned $540 per year for his duties and served until 1908. He refused to accept any changes after a steam-powered fog signal was installed, and decided to resign. At this time, the government also built a breakwater and replaced the lighthouse with a steel tower. The light beam reached thirteen miles out to guide boats toward the harbor. The new fog signal was installed in a separate building on the breakwater (now the base of the modern Big Red). With its boilers fueled by coal, the signal’s sound resembled a locomotive whistle. The structure was far more stable than the former wooden lighthouse, being built on the breakwater instead of on wooden legs, and its upper level was Queen Anne in style with twin roof gables of cedar shakes and Palladian windows. Three keepers tended the light between 1908 and 1912—Charles Bavry, George J. Cornell and Edward Mallette. Constant vigilance may have taken its toll on the men, since their brief terms could not compare to van Regenmorter’s almost forty years. Joseph “Cap” Boshka, who served 15 years in the Lighthouse Service before arriving in Holland in 1912, stayed for almost thirty more years at this station. Boshka and his assistants had to keep watch in six-hour shifts so that the coal furnace kept enough pressure to operate the fog horn. Electricity came to the Holland lighthouse in 1934. The old steel tower was taken down and the electric light housed in a new two-level tower built on the western side between the twin gables. New air-powered horns replaced the steam-powered fog signal. Once the Federal Lighthouse Bureau was abolished and the Coast Guard took charge, the lighthouse keeper and his assistants lost their jobs. “Cap” Boshka retired to Macatawa. Once the Coast Guard decided to abandon the lighthouse in 1970, local citizens organized the Holland Harbor Lighthouse Historical Commission to preserve and restore Big Red. The Coast Guard still performs two inspections per year, however. They also installed a new light that beams outward for twenty miles. The fog signal is no longer used, and the original Fresnel lens can be seen by visitors at the Holland Museum. Holland Harbor Light was awarded protective status by the United States in 2007, the 12th Michigan lighthouse to be listed. 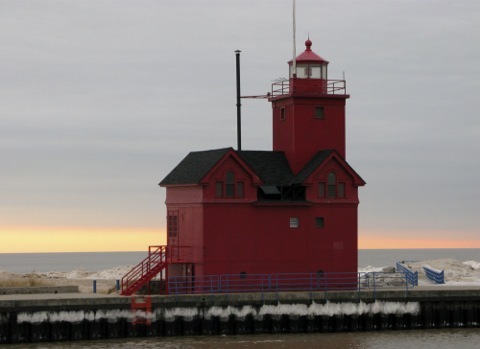 Big Red can be seen from Holland State Park, which is known for its great beach.